How has 2016 been for you? Perhaps you think that Brexit and Trump were good ideas, while Bowie, Prince, Cohen, Wogan, Rickman et al were not, in which case you’ll have yomped merrily through the last 12 months. Personally, I have endured most of this year through gritted teeth and clenched eyelids, bracing myself for the next disaster. This was supposed to have been the Chinese year of the monkey; for me it was more like the year of the steaming heap of dung. I have tried to make myself feel a bit better by actively seeking out signs that things, anywhere, are getting better. 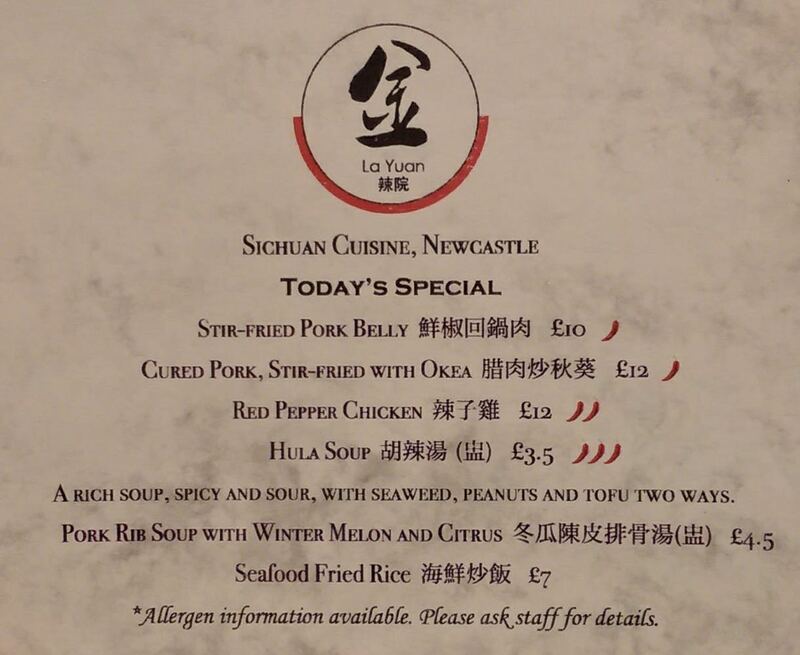 One meagre crumb of comfort I can share with you: I am pleased to report that there’s been a deepening of the pool of restaurants in Newcastle that can prepare a decent Asian meal. 2016 had already brought us Nadon Thai and Thai House Cafe, whilst the hand-pulled noodles at Inoodle were a rare treat. 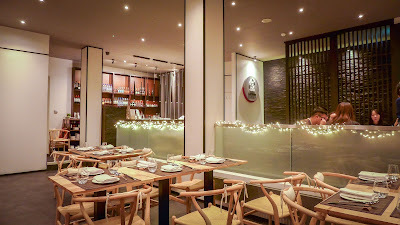 Chaophraya has just opened its doors in the prime perch of Eldon Square, from where I’ll be reporting back very soon indeed, but today, in my last review of the year, I want to add a new Chinese restaurant to my recommended list: La Yuan. 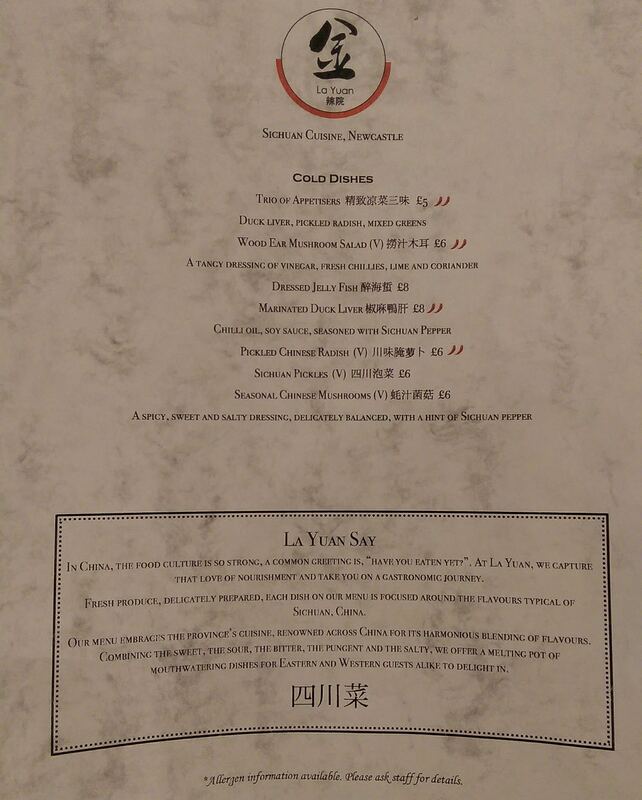 Actually, it should really go without saying that there is no more something called “Chinese” food than there is one called “European”. Covering roughly the same amount of territory, China dwarfs Europe in terms of population, and pretty much matches it in diversity of cuisine. 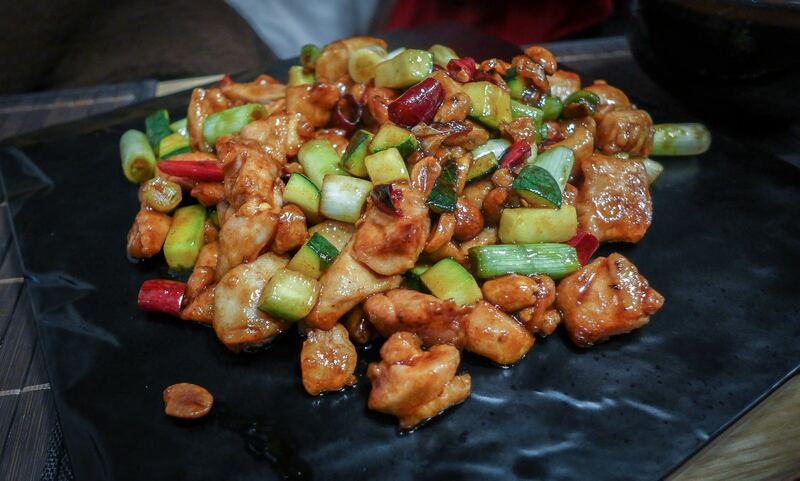 It’s time we stopped lumping it all together and instead celebrate China’s rich multiplicity of cooking styles. 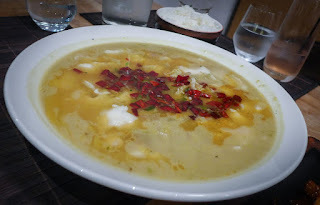 Perhaps most famous is the food of Sichuan province (population: 87 million, plus a few giant pandas), which makes great use of the sour and bitter flavours that come from pickling and fermenting, as well as the numbing tingle of its eponymous peppercorn. This is what La Yuan is bringing to its little slice of Gallowgate, and for the most part it seems to be doing it rather well. 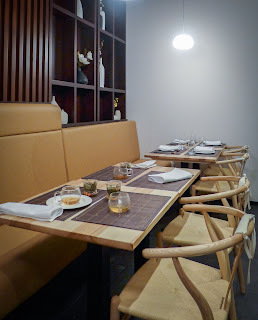 I really liked the calm, minimal, but quite classy interior, with its light wood and whitewash. The total absence of carpets and soft furnishings may make it a little loud when busy, but it was fine when we visited on a steady weeknight. A triptych of cold appetisers got us off to a racing start. Pellets of duck liver were dense but rich, jacked up with the flavour of sesame. Pickled radishes had a glorious twang of black vinegar about them, as well as some other sing-song spice notes that I couldn’t quite place. The same goes for some mixed Sichuan pickles. It’s not often I can’t figure out what’s making something so delicious. Order them yourself and see if you can figure it out. 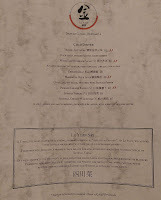 Our main courses were all very enjoyable, without quite fulfilling this early eastern promise. Be warned: dishes are designed to be enjoyed family style, from the middle of the table. Three mains between four would probably be fine, so Mrs Diner and I rather struggled with that number between the two of us. As usual, I battered through everything manfully. My diet starts January 1 (or so Mrs Diner tells me every December). 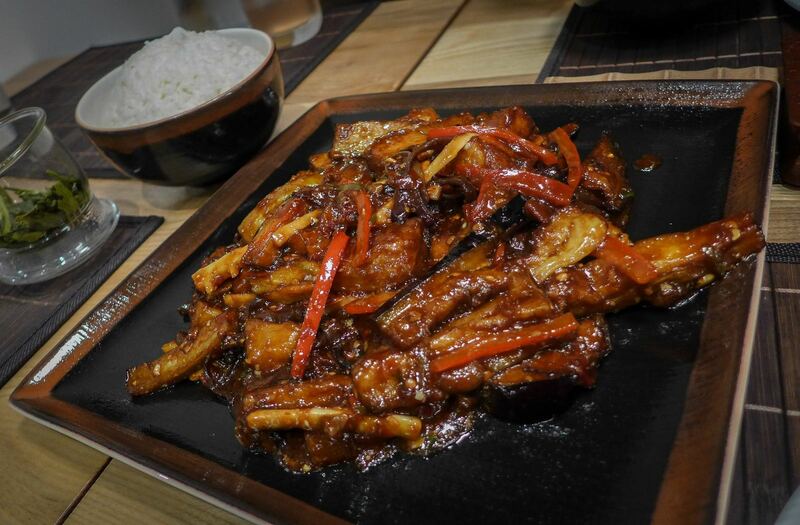 The best was a dish of aubergine yu shiang, or “fish fragrant” (although the ingredients of the sauce: pickled chillies, ginger, garlic and scallions, contain no seafood). It was rather smuttily delicious, the eggplant all creamy and yielding against the crunch of peppers and the tingle of chilli. 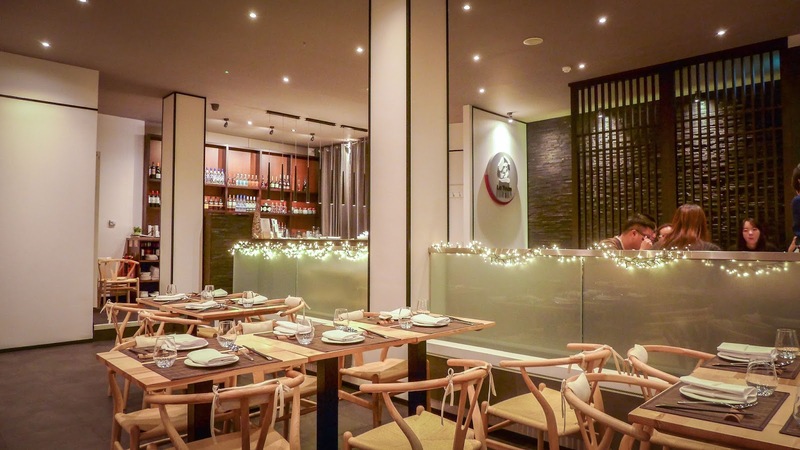 We had asked for recommendations from the completely charming waitress and were steered in the direction of the Long lee fish soup and the Gung bao chicken. The former featured slices of, I think, some sort of sole, bobbing in a vast bowl of calming and restorative broth that was given an extra lactic dimension by pickled greens. 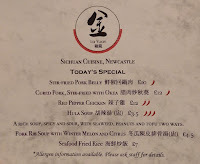 The latter was the least interesting dish of the night, failing to distinguish itself much from a decent takeaway, other than by the inclusion of nicely roasted peanuts. Better were a couple of steamed seafood side dishes I ordered in the name of professional interest and sheer gluttony. 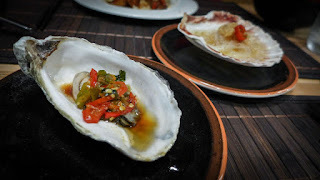 A single oyster with chilli and herbs was a briny bit of fun, but a king scallop, humming with garlic and topped with rice noodles, was plain delicious. Drinks were good, especially if you're in a non-booze frame of mind. 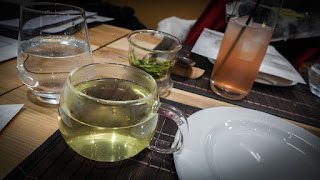 I stuck to a first-rate whole-leaf green tea while Mrs Diner tried an interesting range of sodas, including one quite delicious number involving the normally pointless dragonfruit. I was caught trying to decide between three and four stars when tea turned up again in a pudding and sealed the deal. 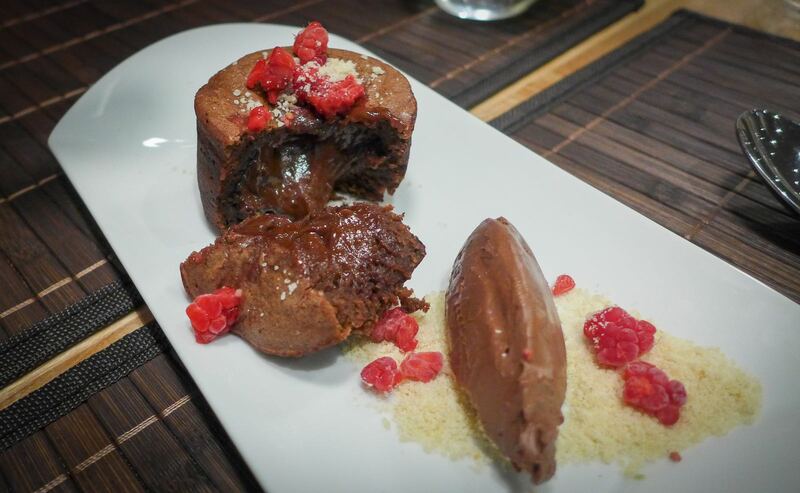 A well-made chocolate fondant was partnered by a quenelle of totally delicious lapsang souchong and chocolate ganache, the smokiness of the tea in perfect balance with the tannic, rich chocolate. This was clever stuff, and needs to be immediately turned into a range of truffles and placed in my Christmas stocking. It’ll take more than one very enjoyable Chinese meal to take the sting out of this rancid git of a year. But sipping the last of my tea and full of the fine flavours of a far off land to which I’ve never even been, the world seemed, at least for an hour and a half, a slightly less grim proposition. And for that I’d say the seventy notes we laid down, including drinks and a tip, were very well spent indeed.